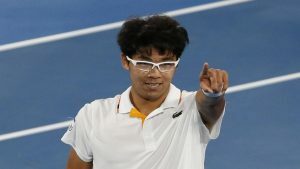 Unseeded Chung Hyeon became the first South Korean to reach a semi-final at a Grand Slam with a dominant straight sets win over American Tennys Sandgren at the Australian Open on Wednesday. Ranked 58, he needed six match points before claiming a 6-4, 7-6 (7/5), 6-3 win in 2hr 28min and will face either defending champion Roger Federer or Tomas Berdych in Friday’s semi-final. Chung is the first South Korean man or woman to reach the semi-finals at a Slam and the youngest at 21 since Russia’s Marat Safin reached the last four in Melbourne in 2010. The rising Korean star joins Briton Kyle Edmund as the first unseeded men’s semi-finalists in Melbourne since Frenchman Jo-Wilfried Tsonga in 2008. Chung, who sensationally knocked out six-time champion Novak Djokovic in the fourth round after taking out Germany’s world No.4 Alexander Zverev in the previous round, had a few nervy minutes before he sealed the victory. In a tense 11-minute final game he claimed victory on his sixth match point after Sandgren threw everything at the South Korean in a bid to stay in the match. “In the last game at 40-0 up I was thinking what I had to do at the ceremony, something like that, and after the break points I was like, nothing to do with ceremony, but just keep playing, stay focused,” Chung said on court in his limited English. The defeat ended an extraordinary tournament for the 97th-ranked Sandgren, who had not won at a Grand Slam before winning four matches here, including upsets of former winner Stan Wawrinka and fifth seed Dominic Thiem. Chung jumped out of the blocks with an early break before taking the opening set in 37 minutes, serving at a high 85 percent. He was playing on the baseline, taking time away from the American and controlling the points. Chung broke in the opening game of the second set with a delightful backhand across the net taking the line. But Sandgren began to get more into the contest and broke back in the fourth when Chung’s forehand was wide. Sandgren broke again in the eighth and was serving for the second set before he was broken with a netted forehand. Chung maintained his level in the tiebreaker, getting to set point before he forced a Sandgren forehand long. Chung broke in the fourth game of the final set and but temporarily his victory charge was stalled before he got home on his sixth match point. The post Chung powers past Sandgren into Open semis appeared first on SABC News – Breaking news, special reports, world, business, sport coverage of all South African current events. Africa's news leader..